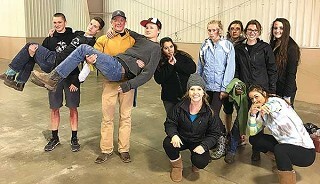 Some 24 Sisters High School (SHS) students and 79 other students from Bend, Redmond, Prineville and Culver headed to Redmond early Friday morning, October 14, to participate in a simulated plane-crash. The event served as training for EMTs and paramedics. All the high school students were “victims” of the crash, and upon arrival were assigned an injury they were instructed to act out. Once assigned their injury, each student got “moulaged” – made up to create an “injury” that appeared as real as possible. SHS student Ashley Adams had a severe compound femur fracture that looked startlingly real. Once all the first responders arrived at Redmond Fairgrounds, students were transported by bus to the “crash-site” just east of the Redmond Airport. Upon arrival, students were told where they should go, according to the severity of the student’s injury. Most were about 100 feet away from the crash-site, where there was metal and scrap burning to make the scene seem as real as possible. Every student lay on the ground and would act out their injury. Once a first responder got to the student, they had to act as if they were really injured. The first responders would triage the patient and assign a certain color according to the severity of the injury. Most students were of either “red” or “yellow” levels of urgency – critical or serious. Most were transported to the triage site on backboards and in neck braces. The students then waited for transport, with EMTs acting out treatment of their injury. A couple students were strapped to gurneys and put in the back of an ambulance. For SHS students this opportunity granted them extra credit and job-shadow hours for the EMS Fire class and Health Occupations class taught by Heather Johnson. The opportunity for students to experience this at no cost to them was a way for students to learn about how first responders handle situations such as a plane-crash, and the triage system they use. It was also a significant opportunity for Sisters emergency personnel. Students training at Sisters’ fire department participate in the event, Craig said. “They got exposure to just what the system looks like,” he said. Craig himself observed the incident command set-up. “Seeing how this region does things was a beneficial thing for me,” he said. A major disaster in one area requires all the agencies in the region to help out, sending ambulances, fire apparatus and personnel. “It very much strains our system,” he said. Everybody, from commanders to first repsonders to victims got a lot out of the day’s events. “The disaster drill was an amazing insight into the world of emergency medicine, and I enjoyed every minute,” said Health Occupations and EMS Fire student and drill attendee Emma Boyer of SHS.